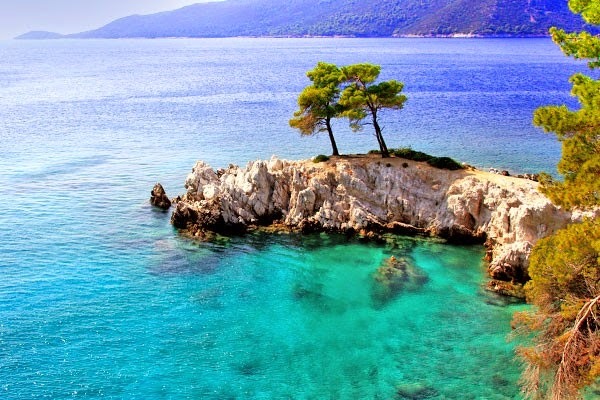 The Greek Island of Skopelos, second biggest island of the Sporades complex after Skiathos, is one of the most beautiful, below-the-radar islands, also famous for reviving century old traditions. Some of the island’s customs date back to the Ancient Greek era and a visit here is like stepping back in time. The low season period is an ideal time to take advantage of the mild, sunny winters, as well as immerse yourself in all these historic traditions. During the two-month period of October and November, people of Skopelos finally find some time to get a rest after the busy tourist period. However, it’s not that they’ll be able to put their feet up for too long, as the olive harvest starts and is a full-on family affair. In fact most villages work together and happiness is spread all around the island. Christmas might not be the biggest holiday, like the Greek Orthodox Easter, but it’s a time when families and friends get together, relatives come home to Greece from all over the world and the festive spirit arrives much earlier than the actual celebration. The Christmas period starts on December 6th, name day of Aghios Nikolaos (St. Nicolas). All houses, pastry shops, bakeries and eating outlets, are filled with traditional Christmas treats and pastries made by the accomplished mothers and fathers of Skopelos. Some of the traditional delicacies of Skopelos you should try are chamali – a sweet in the shape of a star, heart or half moon made of ground almonds and sugar, sweets made from local fruit, such as plums, chestnuts and figs (also known as spoon sweets), and last but not least the spiral tyropita, a Skopelos original. 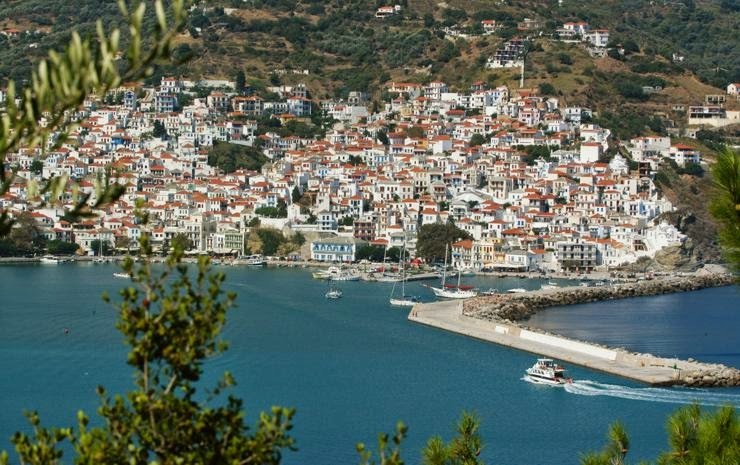 Skopelos is indeed a foodie’s paradise! The overall Christmas atmosphere makes people feel relaxed and life seems to slow down. Skopelos town is beautifully adorned with the usual Christmas decorations, but what you won’t find anywhere else in the Christmas celebrating countries around the world is a miniature wooden ship decorated with colourful lights and put in the front window of every house or building. This is a custom that stems from the tradition of Greece in navigation. Also, every year local businesses together with the town hall organise annual Christmas parties and social events in which big and smaller children can take part. Since the ancient times, the Greeks have dressed up in masquerade masks to honour the God Dionysus. Nowadays, the carnival is organized annually in late February or early March. People are dressed up in crazy costumes and throw parties all over the island. The island is completely transformed and gets into a truly crazy mood. Festivities reach their peak on Trata day. Townsfolk pretend to be seafarers and carry smoke-spewing bamboo boats around the town. The ladies and the kids sing funny songs and neighbours offer food and drinks to the participants. A big celebration takes place on this day. Finally, they end up into the sea sailing their boats to take their revenge on pirate invasions of the past. As it is said Easter in Skopelos is not to be missed as the spirit of the Passion Week is greatly intense on Good Friday and Holy Saturday. On Holy Thursday night, there are women covering a wooden structure resembling Christ’s tomb, called Epitaphios, with flowers, in procession to every church. On Good Friday night the locals carry a plain brown candle which symbolizes the death of Jesus and follow the procession of Epitaphios. Parishes compete with each other in a friendly way about the best decoration. On Holy Saturday night people go to the church and attend the service dedicated to the Christ’s resurrection. At midnight the bells ring and everybody exclaims Christos Anesti meaning that Christ has risen from the dead. The priest offers the congregation the Light of Eternal Life, and this flame is passed from person to person uniting the whole community. People take their candles home and sign a cross on the front door of the house, so it is blessed for the following year. Then a traditional soup mageiritsa (made from lamb offal) is served and so the feast begins with the spinned lamb on Easter Sunday, as well as traditional dancing. People in Skopelos wait for the summer with great anticipation. They eagerly want to dive in the crystal clear sea water and spend long lazy days on the beach, sunbathing, playing ball or hanging at a beach bar knocking back a cocktail. Skopelos is the island where the film Mamma Mia was shot, as well as a place where the wedding of your dreams could be held. 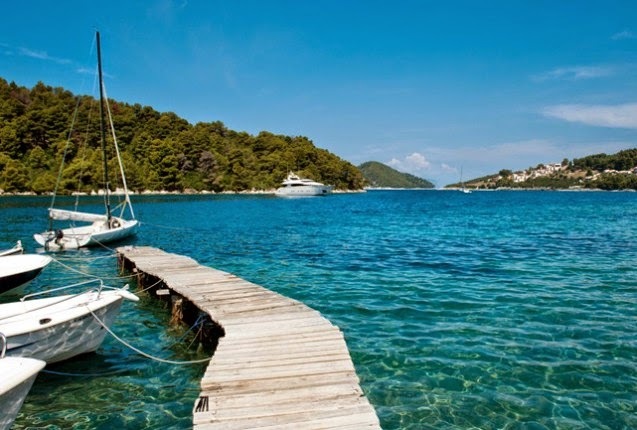 Something for everyone and very beautiful too, Skopelos is well worth seeing this year.